Imagine a room that is so silent that you can hear the blood pulsing through your head. Each breath you take, you hear your lungs filling with air. The rustling of your clothing is suddenly something that you’re aware is happening. These are some of the sounds that people describe hearing while spending time in Apple’s anechoic chamber, one of the quietest rooms in the world. Whether fueled by internet hyperbole or based on different perspectives from different people. Anechoic chambers have garnered a reputation of being able to drive a person mad simply by being in the room for a certain amount of time. Granted, hearing sounds you have never heard before can be somewhat distracting, there doesn’t seem to be much truth to this myth, as countless people have been able to spend long periods of time within the room without being driven to madness. That being said, people can still experience different sensations such as dizziness, heightened sense of smell, not being aware of how much time has truly passed or in rare cases, hallucinations. 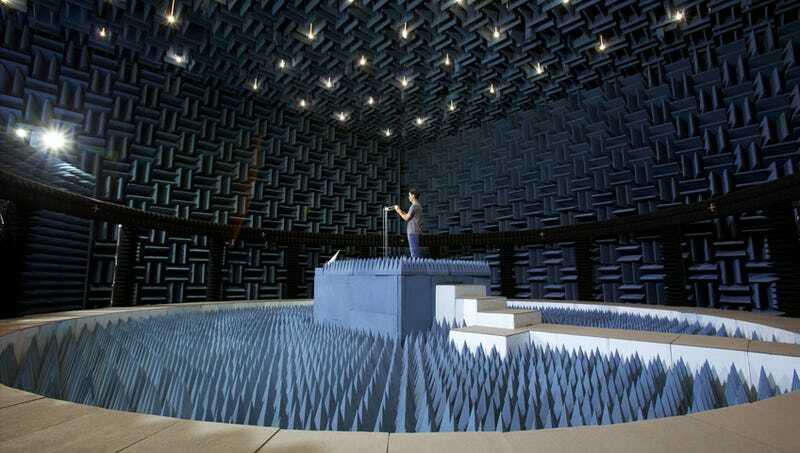 Internet fantasy aside, anechoic chambers have very real and practical use for companies. The chambers are primarily used to record and analyze the sounds that products make, usually to improve the user experience. Users are more likely to purchase a product that they enjoy using, and part of the enjoyment that people experience when using a product is based in the sounds that the product generates when being used. Combined with other sensations like tactile feedback or screen responsiveness, the right sound, or even the lack of sound entirely, can make the difference between an average product and one that the masses truly love. The importance of sound then becomes very important, as companies will invest in this type of research if it means gaining an edge towards being the leader in their market. Anechoic Chambers are rooms that are designed to absorb sound or electromagnetic waves. The walls, ceiling and even sometimes the floor are covered with wedge shaped pieces that cause sound to bounce between the open air gap in the wedges, thus absorbing sound. Recent designs also reduce external noise and block radio frequencies to allow for the testing of antennas, radar or for electromagnetic interference testing. Full or Acoustic Anechoic Chambers attempt to absorb sounds from all directions. Semi Anechoic Chambers will typically have solid floors. These floors act as work surfaces for heavy objects such as vehicles or large pieces of equipment. Radio Frequency Anechoic Chambers which often times appear similar to Full chambers but the wedges are coated with radiation absorbing material instead of acoustically absorbent material. These are usually used for housing equipment for measuring antenna radiation patterns or electromagnetic compatibility. Often times, RF chambers will also exhibit many of the same characteristics as acoustic chambers such as shielding of outside noises and attenuation of sound. Where Do These Myths Come from Anyway? Is There Really Any Truth to Them? There may be something to all of the tinfoil hat forum posts floating around the internet about anechoic chambers after all. On an average day, there is typically 30 – 60 decibels of noise going on around us at any given time – this is a lot for our brains to manage and filter out the unimportant stuff while still keeping us informed enough to keep us safe. A sudden lack of this constant stream of noise can be disorientating and this is likely where the myth of anechoic chambers driving people to madness in 45 minutes originate. We have grown so accustom to this noise that it’s become the norm, so suddenly being placed in an environment specifically built to filter these noises and mitigate all but the most minute of sounds can cause us to experience some weird things. Luckily, anechoic chambers were not built to deprive us of our senses (or drive us mad), but instead help companies test their products without being influenced by outside interference.